Many of the area’s valued IVI customers and vendor partners are able to join IVI owners and associates at our hospitality sponsorship tent at the Famous Idaho Potato Bowl, which is held annually at Boise State University’s Bronco Stadium. The Boys and Girls Club of Ada County is an organization in the community of our corporate office in Nampa, Idaho, USA. Their area clubs serve over 4,000 area youth, ages 6 to 18. These young people are provided a safe place after school, life-enhancing programs, and ongoing relationships with caring adults. 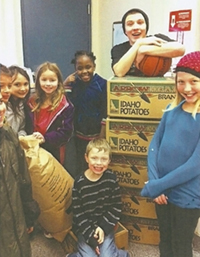 During the 2012 holiday season, IVI was joined by Lamb Weston and Arrowhead Potato in supporting the Boys & Girls club of Ada County with instant mashed and fresh potatoes. IVI has supported the Ada County Boys & Girls Club by participating in the annual “Spud Challenge” Golf Tournament. Our team plays for fun, plays for the kids, and plays to win.